Thailand faces an upcoming referendum regarding a new national charter meant to put the country back on track after over a decade of political conflict revolving around US-backed proxy Thaksin Shinawatra. 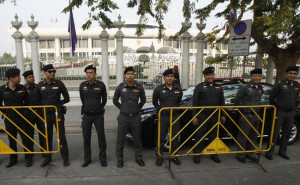 Shinawatra and his foreign sponsors have increased pressure on the Thai government as the vote in early August nears. This includes maneuvering into place overt fronts engaged in political agitation, and leveraging the West’s monopoly over the international media to portray any attempt to crackdown on such fronts as heavy-handed and unjust. The Asian Network for Free Elections (ANFREL) said that repeated attempts to gain accreditation to monitor the August 7 referendum, Thailand’s first trip to the polls since the military took power in 2014, were met with silence. What the Nation does not report is who ANFREL is, who funds them, or the obvious conflicts of interest involved in their “monitoring” work across all of Asia, including Thailand. ANFREL is funded by the US State Department through the National Endowment for Democracy (NED), USAID, convicted financial criminal George Soros‘ “Open Society Institution” (OSI), and even the Australian government and the British Embassy. Regarding the budget for 2010, NED has provided supported for administration expenses while other activities have been supported on a project by project basis by AusAid, USAID, OSI, Euro-Burma, Netherlands Embassy, TAF, Misereor and the British Embassy. ANFREL’s 2011 report also makes mention of US State Department NED subsidiary, the National Democratic Institute (NDI), on page 5 (3/30 of the .pdf). In all of ANFREL’s annual reports, none of these organizations are mentioned by their full names, and in no part of the annual reports are ANFREL’s financial sponsors fully and transparently enumerated. GNDEM appreciates the support provided by the National Endowment for Democracy (NED) and the support that the NED and USAID have provided to the process surrounding the Declaration of Global Principles for Nonpartisan Election Observation and Monitoring by Citizen Organizations. One wonders whose best interests are served by such “monitoring” groups who apparently cannot find any support in the very region they supposedly serve, and instead rely entirely on foreign funding from nations who have historically sought to control and subjugate Asia, its people, and their resources. More alarming than ANFREL’s foreign sponsors or the fact that it serves as an instrument for foreign interests to interfere with the internal political affairs of sovereign nations in Asia – particularly in light of the US’ own allegations that Russia is doing likewise in regards to US elections – is the fact that the US State Department, the NED, NDI, and Open Society are also engaged in funding overt opposition groups across Asia, including in Thailand. Even on ANFREL’s own website, they repeatedly support Malaysia-based Bersih, applauding them for contrived awards bestowed upon them by the same foreign interests funding their disruptive behavior. On ANFREL’s Facebook page, they even allege that Bersih serves as part of their monitoring network. An organization like ANFREL which masquerades as an “election monitoring” organization, that has clearly picked sides and openly backs and supports opposition groups, cannot in any way be trusted to impartially monitor elections. Then again, would honest, impartial observers expect a foreign-funded “monitoring” organization to not be used to manipulate the outcome of elections? The Thai government’s move to deny ANFREL accreditation is clearly justified. But despite this, that the Western media is able to portray the barring of a clearly compromised, biased organization as an obstruction to free and fair voting, illustrates how the US uses both fraudulent nongovernmental organizations (NGOs) and the media in tandem to pressure, manipulate, and meddle in the affairs of nations around the world. Thailand’s ability to accurately and concisely expose what the reasoning was behind its decision regarding ANFREL through independent media organizations would do much in blunting the counterattack across the Western media Thailand now faces. Having failed to do this, however, Thailand will likely face a difficult choice between weathering the concerted campaign of abuse now targeting them, or capitulating regarding ANFREL and allowing it to meddle in Thailand’s upcoming referendum with absolute impunity. Also important to note, Thailand’s stability and ability to move forward with a new charter dovetails with the larger conflict unfolding across Asia as Washington and Beijing attempt to assert Western and Eastern control, respectively, over the Asian region. A destabilized Thailand, or worse yet, one handed back under the control of Shinawatra and his allies, would serve to tip the balance in Washington’s favor. It is no wonder then, why the US has invested so heavily in manipulating political events unfolding in Thailand – it is about more than just Thailand, it is a smaller part of a much larger hegemonic project.